13/06/2011 - This weekend saw a southern contingent attend the national BikeNZ Road and Track Annual General Meeting in Auckland. Although an AGM has many people running (or should I say biking) in the other direction, this weekend represented an opportunity to discuss the key issues facing the sport on a national and local level with representatives from BikeNZ and delegates from cycling centres around the country. As with all get-togethers of this nature, it also provided a forum to share ideas, explore solutions to challenges and continue friendships formed over many years or create new ones. It also provides the chance to recognise the contribution made to the sport of cycling this year. 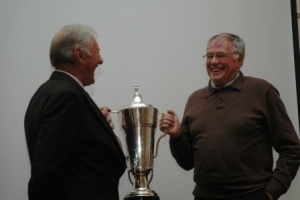 On Saturday night our own Graham Sycamore was bestowed the honour of winning the Malayan Cup for 2011. The man we all know as Syccie has contributed a life-time to the sport and Cycling Southland is delighted to see over 50 years of service recognised with the sport’s most prestigious award. What made the night even more special was that Warwick Dalton was on-hand to make the presentation. Dalton, who often went head-to-head with Graham at Kew Bowl back in the 60s won the Malayan Cup along with his New Zealand team mates in 1957, ironically the very year Syccie took up bike riding. Very few can tell a story as good as Dalton does and he still looks like he’d be able to handle himself in a sprint finish. He fondly recalled his most recent world championship victory, won in Sydney a few short years ago, which went to a judges’ decision following a protest by one of his beaten competitors. The Chief Judge promptly reported “there was nothing to see,” and Dalton duly won his Masters World title. The judge’s name? G Sycamore, New Zealand. In true Syccie style the win left him speechless ... yes, of course I’m joking. Once the initial surprise at his name being read out had worn off, he recalled a few of the many highlights of a glittering career. And he was as humble as ever, paying special tribute to those who serve the sport throughout the country and singling out his wife Bernie who Graham confirmed does three-quarters of his work for him. Every cycling club needs a Graham Sycamore. But only one has one. I’m very thankful it is us. We also were delighted a host of other Cycling Southland members were recognised at the Volunteer Awards. Local legend Tony Ineson was a finalist in the Lifetime Official category (for ten or more years service) while our Senior Road Convenor Waine Harding featured in the list of finalists for the Newcomer category. The Faces of Cycling awards recognised those who are role models for the sport, both on the bike and as ambassadors. Sequoia Cooper, Gabby Vermunt and our Development Officer Matt Archibald were all nominated. Nights like this provide another reminder of how fortunate Cycling Southland is to have people of this calibre in our organisation. I thank them all.